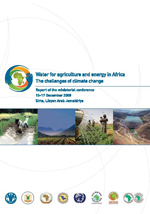 The Ministerial Conference on â€œWater for Agriculture and Energy in Africa: the Challenges of Climate Change � was held in Sirte, Libyan Arab Jamahiriya, on the 15-17 December 2008. The Conference discussed the prospect for food end energy demand by 2015 and the projections for 2030 and 2050, based on the key drives of population and income growth and under the threat of climate change, concluding that policy decisions and budget allocations should as well be made available for large-scale for irrigated agriculture and hydropower generation. While recognizing the importance of national financing and regional cooperation for implementing strategies to address country needs and boost food production, the Conference Declaration appealed to multilateral agencies for additional funding and called upon developed and developing countries to realize their commitments in terms of budget allocation to agricultural production. The Sirte Declaration called upon the African Union Commission to design a road map and mechanism for monitoring and evaluating implementation, in collaboration with FAO, The African Development Bank, The Economic Commission for Africa, NEPAD, and the Libyan Arab Jamahiriya.